Lets say you have generated the Weights for your mesh during the binding step above (you used Bones as weight source). Blender does a rather good job on automatically determining the weights. However the results are sometimes not yet perfect. Hence the very first thing that you must do now is to check if the Mesh behaves well and follows the animation of the armature. Here are a few tips for getting started. Open the Properties sidebar (type “n”). Open the Object data Properties. Navigate to the Vertex Groups list. Now you can scroll through the list of vertex groups and you instantly see the current weight group displayed on your mesh. 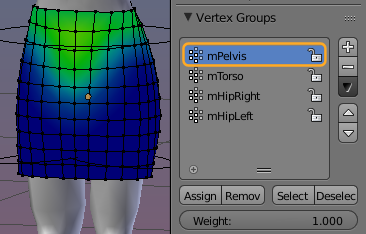 In the image i have selected the mPelvis weight group, thus the weight map display changes on the skirt. Switch your mesh to Object Mode. 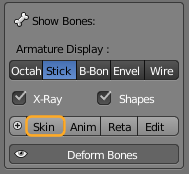 In the Tool Shelf (Avastar Tab) locate the “Show Bones” Section (in the Skinning & Rigging panel). 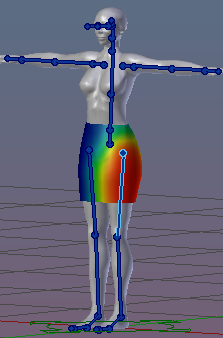 When you now select an mBone (blue) Blender also switches to the corresponding weight map. While in Weight Paint mode, you can also Pose the mBones. But beware: Avastar’s mBones can only be rotated! they can not be moved. Note: For our purpose it is sufficient to have the Hip bones rotated by +/- 25°. I also rotated both lower legs back by 25°. This gives a good test pose that is good enough for inspecting where the weights need to be fixed. Important: This was just a quick test. We will not continue to use this pose! There is a much better method (see “create a walk animation for testing”) below. For a running walk cycle the maximum distance between the feet is approximately equal to 1.5*length of the legs (that is a very fast running though). 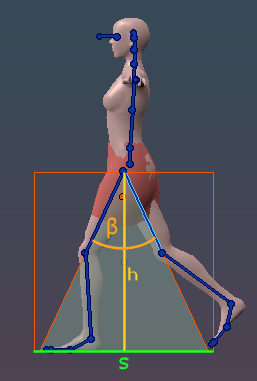 This translates to about β=75° for the maximum angle between the legs (see image above). For a fast (energetic) walk the maximum distance between the feet is approximately equal to the length of the legs. That translates to about β=50° for the maximum angle between the legs. For a slow walk (and for a fashion walks as well) the maximum distance between the feet is approximately about half the length of the legs. And that translates to a maximum angle of about β=30° between the legs. Of course when you are working on a Ballet tutu then you may need to test much higher angles as well. So, you see, there is no one fits all answer. But for our purpose a maximum angle of 50° between the legs should be working very well. Here is a nice little trick that can help you a lot while you are weighting your model. The key idea is to create a very basic animation cycle that contains the extreme positions that you plan to support. Then use the timeline to scrub repeatedly over your animation to check your weighting. Your poses are well defined: So you can step to a certain time frame and get the pose for that frame. Thus you can quickly check how a certain change in the weights influences other poses. 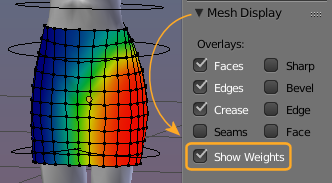 You can “see” your mesh in action: So you can check if the mesh transitions work as anticipated. You can change the pose in context: So you even can now work and keep in Edit mode all the time. When you need to change a bone position, then just scrub on the Timeline without leaving Edit mode. You can play the timeline: thus you can even edit your mesh while the animation runs. Of course you can do this as well. There are thousands of ready made Animations available for Second Life. And Avastar provides a feature to import them and add them to an Avastar rig. The procedure might first look a bit tedious, but you will quickly find it working like a charm. I have shown you before that you can inspect weights in edit mode. However we realize quickly that although the weights are displayed perfectly, the mesh does not behave as expected. It looks like the armature does not influence the mesh in edit mode. As soon as the modifier option is set, the mesh will follow the pose exactly like it does in Weight Paint mode. (1): In simple words the Edit Cage is the raw mesh, without any modifier applied and with no constraints applied. Actually the edit cage may look quiet different from the final mesh. 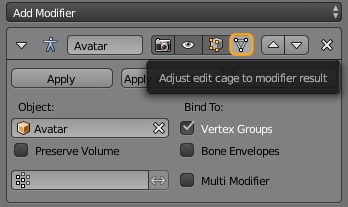 The Adjust Edit Cage to Modifier Result applies the current modifier’s influence on the mesh to the edit cage. Thus when this option is enabled the edited Mesh will look like the final rendered mesh, although you only can edit the raw vertices of the Mesh at any time. I assume that you have added a simple walk cycle as i explained in the Advanced Tip above: Testing by scrubbing (see above) And you have prepared the timeline accordingly. 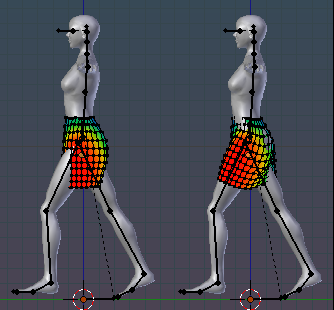 However if you find the creation of the walk cycle is too much for a first try, then you always can move the bones manually as well instead of scrubbing along the timeline.